Over the past week, the Swarthmore women’s basketball team has put up some spirited efforts. Despite not coming away with any wins, the Garnet have had many strong stretches in each game and have shown promise for the rest of their season and years to come. In last week’s loss to Muhlenberg, the Garnet received a strong performance from sophomore Faith Nation. The guard from Allentown, PA put up a game-high 17 points while sinking three shots from beyond the arc. The Garnet return to action this Saturday with a home matchup against Gettysburg. The game will be at 1:00 p.m. at Tarble Pavilion. Jack Corkery: What is your major, and what led you to choose it? Faith Nation: I’m planning on majoring in Psychology here at Swarthmore. I’m pre-med and didn’t necessarily want to major in a natural science, so I chose this because I find it interesting to understand people’s behaviors and think that being able to understand people and relate better would be a good skill to have as a doctor. JC: Your background is unique, as you did not play for the basketball team as a first-year and joined as a sophomore. Could you talk more about how you made the decision to play this year? FN: I had played basketball throughout high school but had some injuries so I wanted to take time off to let my body really heal. I also wanted to make sure that I’d be able to keep up with the rigor of Swat’s academics since playing a sport is such a large time commitment and I didn’t want my grades to suffer. 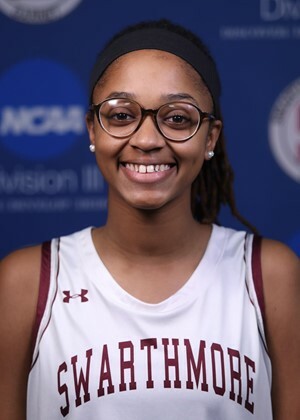 JC: As someone who has been both a student-athlete and a non-athlete, could you talk about some of the biggest differences between both lifestyles here at Swarthmore? FN: You spend a lot of time with your teammates which is great since I get along with them really well, but it’s a large time commitment so my “free time” that I had last year has been taken up by basketball. JC: What led you to choose to attend Swarthmore? FN: My oldest brother went here so I had heard about Swarthmore through him and instantly fell in love with the school when I came here to see him graduate. I also only live an hour away so the security of knowing that I can go home pretty easily if I want to is nice. JC: What is your favorite place around campus? FN: I like Essie’s because it’s a change from Sharples with regards to food, but also another space where I can go to do work and focus. JC: What led you to originally begin playing basketball? FN: Basketball’s definitely a big thing in my family but I started playing the latest out of all of my siblings. One of my friends needed an extra player for her rec team when we were in sixth grade and she asked if I wanted to play with them so that’s when I officially started. FN: I’d want a path put across Mertz field so that when I cut across to walk to the Fieldhouse my shoes don’t get super muddy. FN: We’ve struggled some this season so honestly just continuing to stick together as a team and consistently play our game and maybe even getting a few wins under our belt would be an awesome way to finish out our season.